When your available storage space appears to be maxed out, it is necessary to seek out new and innovative ways to utilise the space at your disposal. Rackzone brings to the market high quality, well-constructed and cost-effective louvre panels which can optimise your available space and create a number of new storage opportunities. Each wall mounted louvre panel can be fixed to the walls of your storage area and used for hanging storage boxes to store smaller items. This makes them easier to pick and identify as well as getting these smaller storage boxes off the floors or taking up space on larger shelving systems. The 1000H x 500W louvre panel gives you plenty of available hanging space for your smaller storage boxes. These panels can also be configured to suit your individual needs and are suitable for fixing to larger surfaces. 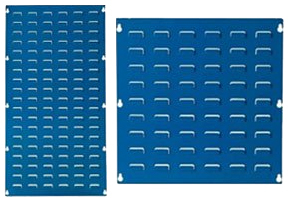 The dimensions of these louvre panels are rectangular shaped which makes them suitable for affixing around a workbench or on any area where you require storage width rather than height. These louvre panels are square shaped and can create a large hanging storage space in any number of settings include industrial areas, warehousing, workshops and garages and sheds.You can purchase these louvre panels for storage boxes directly from us via our online store where you can also avail of next day delivery.